Features and Benefits UltraComfort - Ultra-soft, next generation nitrile formulation provides the relaxed fit and feel that you would expect from a latex glove UltraDurable - High quality nitrile offers reliable barrier protection against many hazardous and infectious substances UltraGrip - Unique manufacturing process delivers an outstanding grip in wet and dry environments UltraValue - The comfort of latex in an affordable nitrile glove provides the superior value you have been searching for in a synthetic glove UltraProtection - Extended cuff for extra protection over the wrist and forearm in high risk environmentsUltraSense™ EC is a powder-free extended cuff, nitrile glove with the comfort, fit, and feel of latex. UltraSense™ EC offers amazing comfort combined with extra protection over the wrist and forearm for use in high-risk environments. UltraSense™ EC is the most significant advancement in synthetic extended cuff gloves in recent history, combining next generation technology with more efficient manufacturing processes, to bring end-users a breakthrough product, at a competitive price point! 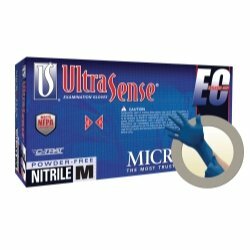 UltraSense™ EC comes in boxes of 100, at a price comparable to competitive extended cuff gloves that typically come in boxes of 50. See for yourself why Microflex gloves are user’s first choice nationwide! View More In Non-Sterile Gloves.